According to a fresh report of WWD, there has been a significant growth in the demands of denim outfits. In the past few years, it has come up as a major fashion trend and also it is meeting the fashion requirements of a large number of people in the world. Earlier, the fashion of denim was restricted under the limits of western dresses, shirts, and tops, now fashion designers are making boom with their totally new concept of traditionally modern clothing for Indian women. With these Kurtis, fashion designers are all set to break the barriers for those who don’t much prefer jeans. If you are one among many who love experimenting with their looks and also have a great love for traditional wear, this blog consisting of information about denim Kurtis is definitely for you. There is a saying that if you dress shabbily and they remember the dress but if you dress impeccably and they remember you. This highly modish and chic Kurtis is just the best choice for women with great fashion taste or perhaps for you. Just a glance of this one of modern denim Kurtis elaborates fine amalgamation of trend and culture altogether. The Kurtis is just the right pick for a party. Working women spend most of their time at their workplace and therefore, they like having a pretty collection to good-looking office-wear to get admired by their colleagues. If you want people to turn their eyeballs to you and admire your style, do not forget owning this stylish, attractive, comfortable and contemporary traditional wear. 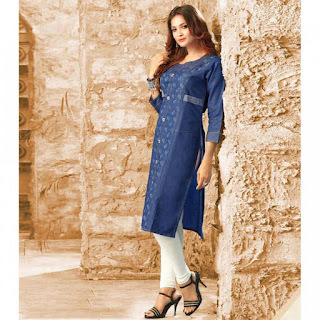 What is the first thing that comes to your mind after seeing this pretty denim Kurtis? Well, this could be either best choice for a get-together or a festival. Obviously yes! This plain blue straight Kurti bestows royalty even at its first sight. This very comfy, beautiful and well-groomed Kurti will let you enjoy togetherness even it is during the summers. The Kurti is another fine choice for an event you are going to attend during the summer season. Or if you have an office party organized for your team, do not miss picking up this choice. 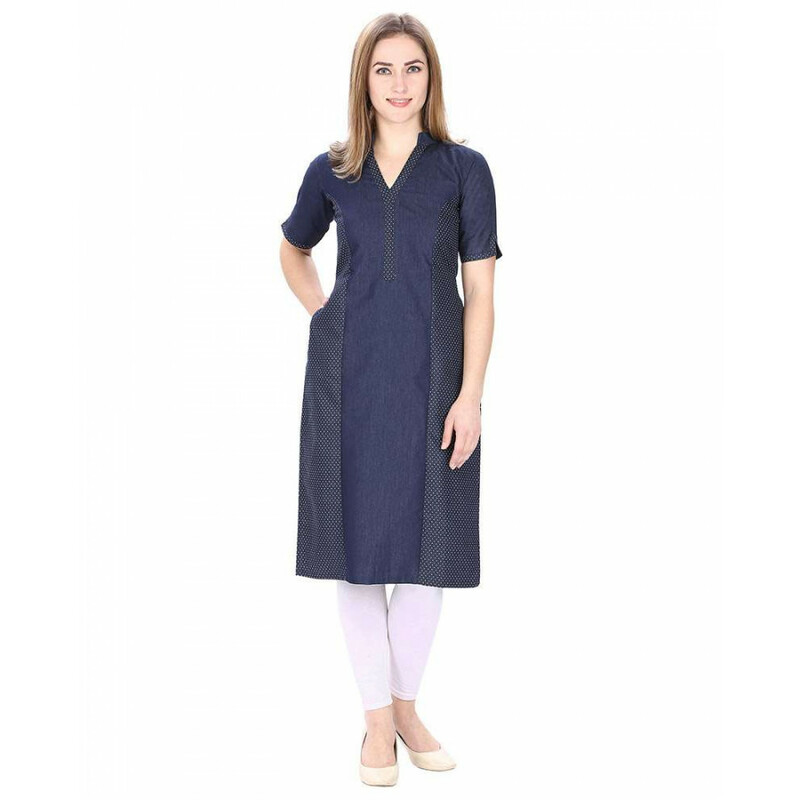 Available online, this fine denim Kurti is just making a noise among the girls who have not tried the traditional wear yet. If you think you are one among them, this outfit is just good to go. Available at quite pocket-friendly prices, this denim kurti designed with wonderful prints can let you flaunt your fashion style while going the market or visiting to your friend. This navy printed straight kurti will simply enhance your femininity and your selection for fashionable outfits.